PSP Minis | Binary Messiah - Reviews for Games, Books, Gadgets and more! Hero of Sparta is probably the most technically impressive PSP Mini that has launched alongside the PSP Go. Hero of Sparta follows a Spartan warrior who is trying to seek the entrance to Atlantis. Along the way, you pick up ancient weapons and armor to help you along the way. Sparta has a simple combat system with heavy and light attacks along with a magic attack with each weapon you get. Simple combos can be created to wipe out these mythical creatures you fight. Larger enemies can be taken down God of War style via timed button presses. While this isn’t nearly as epic as God of War it’s nice to see the devs at least tried. Along the way you can jump across gaps by just moving over to them and climbing up by pressing X. Navigating can be fairly simple thanks to the compass arrow on the top of the screen to its kind of hard to get lost. If you are wondering about boss fights there are a few epic ones, but they are short lived and it makes you want more. Every one of the 6 or so levels is very linear and you have to be a moron to get lost in them. Sometimes you will venture upon spikes coming out of the floor, or like in one level, swinging axes, but traps and obstacles are far and few in between. If you get low on health or mana you can get the orbs from fallen foes (kind of like in God of War) or through power-up pools which can be used an infinite amount of times. The hardest part of the game is fighting off the mass amount of enemies that get tossed at you. While they are pretty easy to take down it will be the lack of checkpoints that will kill you. Some levels don’t have any at all, and the ones that do have them in the wrong places. Playing the game is pretty straightforward and you can’t expect much from an iPhone port since the iPhone has limited controls. However, the game features some pretty epic music and backgrounds. The graphics kind of look like first generation PSP launch titles (dropped two notches from there) and you have an idea of what the game looks like. My biggest gripe is that most of the enemies are hard to see in detail, but that’s alright the game is too short to really care anyway. If you really want a God of War knocks off or something remotely entertaining have at it. Cooking Jam is one of those little games that you wish were just a tad more fun. 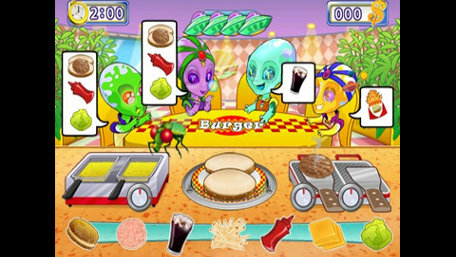 In Cooking Jam you can make four different kinds of dishes: Hot dogs, burgers, pizza, and tacos. You have four seats in front of you and when customers come in you hand out menus and wait for their orders to pop up beside them. For example, if you’re cooking hot dogs, you have to stick the buns on a bun warmer, hot dogs on a dog warmer, and then put either ketchup, mustard, or onions on them depending on the order. You can adjust the heat on the warmers, but if you wait too long they will burn to a crisp. You can still serve this, but you will get a smaller tip. Sometimes customers want a soda or even fries. While this sounds simple that’s really all there is to it. Nothing ever gets hectic since you only have up to four people at a time. Sometimes they will order more than once and that can throw you off at first, but everything is always manageable. The goal is to fill your money meter to make the quota for the day, but this is always too easy even when making food takes money away. If you customers get impatient you can use a “secret ingredient” depending on what type of people they are. Speaking of that the graphics are really simple and so is the sound. The graphics are bright and colorful, but they are repetitive and nothing really interesting. The same song loops in the background over and over, and the grunts and various sounds are all repeated constantly and it just gets old really fast. 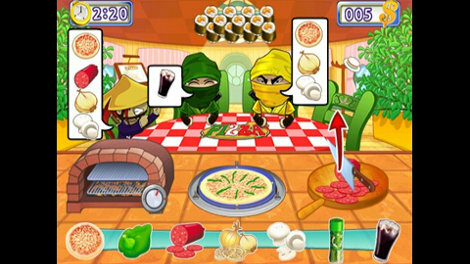 The bottom line is after you try each dish once you will get tired of the game, and I doubt you will play through all 48 stages. I just wish this game had more variety because it has a lot of potential. We’ve played dozens if not hundreds of butchered Tetris games, and some remakes spreading from handhelds to the Virtual Boy and even on current generation consoles, but nothing stands up to the classic that we loved on the GameBoy and PC. EA’s version has the original Tetris game without adding anything really fancy. The background is blue with a grid, and nicely colored Tetrominoes, and surprisingly, an awesome remix of the classic theme. Building lines across a grid to great music with increasing difficulty is just instant fun and it’s a game you can’t get bored of, but you can play for five minutes or five hours and you’ll have a blast. Of course, there ARE reimaginings of Tetris in this game, but they keep their distance from the original and just coax you enough to check them out. You have 40 lines which are the classic that is pretty self-explanatory, then you have Treadmill which is moving all the pieces to the right which makes you think ahead before places pieces. Gravity makes all “loose” blocks fall into place closing gaps…or running. Then you have tons of modes you can unlock and these are great and don’t really ruin the original formula. One problem is there is no multiplayer, but that is ok since Tetris was originally a single player only game. There is lots of stat tracking, a glossary, and tons of options for people who love tweaking. Overall Tetris on PSP is a great port of the mobile game and should be owned by any puzzle or Tetris fan. If you haven’t already heard the PSP Go is out (a.k.a PSP-N1000) and alongside, this Sony launched the PSP Mini lineup which are cell phone games ported to the PSP. Some of these ports were updated and some weren’t. 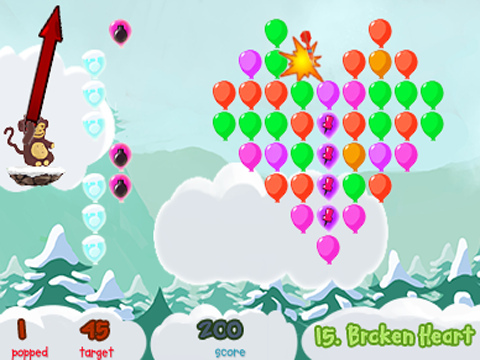 Bloons is a puzzle game that has a mix of Bust-A-Move and darts and will keep you busy for quite awhile. You are a monkey with an arrow that you can spin around and stretch out. The farther you stretch it out the less of an arch your throw will be. You get a set amount of darts in each level to complete the objective. 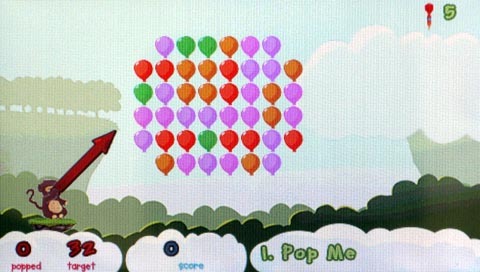 There are a minimum amount of balloons you need to pop to pass and sometimes there are obstacles in your way. There are quite a few actually from brick walls you need to shoot around, ice balloons that freeze all nearby ones, a bouncy rope that bounces back your darts, breakable bricks and the list goes on. I never felt bored with this game since each level is different and the progression in difficulty is fairly nice. The main issue I had with the game is that it was too simple and the arrow takes forever to turn around. The graphics are very simple and don’t really push the PSP at all; plus the sound is pretty empty with the same music loop and annoying sounds. Otherwise, Bloons is an excellent way to pass the time and should definitely be picked up.